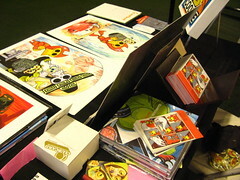 Fall '10- APE, NYCC, Dinosaurs and More! It's been a crazy year so far! Last month my artwork went public in the BART system. Around that same time I got weirdly internet-famous for drawing cute animals on YouTube. And THEN I did the 15th Anniversary poster for Laughing Squid which spawned a great interview on PsPrint.com. But that's just the primer for Fall 2010! Things are really going to get nuts next week as I appear at the New York Comic Con in Artist Alley. It's been a while since I've been back to New York and I'm excited for the trip. I'll be selling art prints and making sketches for the masses so please come by and say hello. If you catch me early you can get in on my NYCC exclusive print, a chubby Wonder Woman pin-up titled, "BBWW". I'm only going to bring a few, so if you really want one, you can pre-order it on my web-store and pick it up at the show. I'm also pumped because I can finally accept credit cards on-site at NYCC thanks to the fine people at Square (it's the future). The following weekend is the Alternative Press Expo (APE) in San Francisco, my home turf. I look forward to APE every year and I hear that it's even bigger than it was last year. They've expanded the hall, so I think it's a completely different layout. Come find me and artwork. I think I'm going to open up the archives and bring some one-of-a-kind items. Also, on the Friday before APE, I've got some artwork in THE DINO SHOW, a dinosaur-centric art show at Double Punch Gallery in San Francisco. It's bound to be a hoot, so come get Jurassic with all your favorite local artists. In case you've missed out on NYCC and APE, you can still get my artwork online at my web store. I'm happy to announce that you can now choose from three different sizes of prints in my "Featured Items" section. I also have a "Sale Items" section where you can take advantage of my overstock prints at great prices. If you are looking for original artwork, I have an Etsy store with one-of-a-kind paintings for sale. Soon I'll be offering limited edition and oversized prints as well.